Content by Tony Macklin. Originally published on January 1, 1995 @ tonymacklin.net. 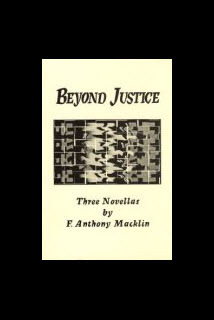 In the three novellas is Beyond Justice, private detective Peter Owen Erskine embarks on an erratic search for identity in the modern world. In The Seventh Widow, Erskine searches for the perfect woman and the meaning of love. In The Ice Age, he seeks the meaning of age and responsibility. And in the third novella, Unfinished Business, Erskine tries to cope with his knowledge. John Daniel, Publisher: "This is an entertaining, page-turning, pot-boiling, P-I romp. Peter fits into a fine tradition of oversexed sleuths, and his women are intriguing. I call this a good read, and I admire the author's ability to get a plot running and keep it running."